Snowflakes ... I think perhaps everyone has heard that they are each uniquely perfect and individual in their expression of form. Yet each is merely frozen water. Unfortunately, when snowflakes are viewed with the "naked eye" their exquisite geometry is just a blur. When you look at snow that blankets the ground, you cannot see the beautiful intricacies of each flake nor the way the flakes are joining together. Such a shame, I am reflecting, as there is such a beautiful analogy in this example of snow. We, too, are uniquely beautiful, multifaceted, and fascinating. Many times our human eyes cannot see the exquisite perfection in our BEingness! Yet, the blanket called "humanity" that we create together is mysteriously and intricately woven. I want to share how this dance we call "life" provides myriad opportunities to not only sparkle in our own unique brilliance, but to also influence and help others, as they influence and help us. Yesterday, I was the featured guest on the 10 am PST edition of The Dr. Pat Show. As part of the interview, Dr. Pat suggested I do live help-sessions with a couple of individuals. More callers were taken than time allotted, and I didn't even get to speak with the third caller on hold. Yet I was moved to gift him his choice of my healing chakra prints..."Chakra Healing Love", "Chakra Energy" (both 12"x36") or "Chakras on the Horizon" (36"x12"). [You may view and purchase my healing artwork HERE.] After the show I felt badly, as if I had neglected this last caller who had been promised time with me. Then I received the most amazing email from him: "Thank you so much for your generous gift. I accept it and I must say I received your healing energy that I needed. I needed one of My chakras to be opened. That is why the artwork is such a perfect gift. Chakra Healing Love would be perfect for My place. Love and Light blessings to you. Your energy is beautiful as [is] your spirit." So, despite my feeling I had neglected this individual, he had received EXACTLY what he was seeking! Think about the mysteries which unfolded here ... Something led him to listen to the show. Something led him to call, and he was placed in the cue. He was not placed first, not second, but third in line. And, without speaking with him, something led me to offer him a Chakra Healing print. What a fantastically interwoven dance! Synchronicities like this are what I, and others, call "being in the flow". So, you have these beautifully unique and wonderful snowflakes. In and of themselves, they do not offer much. If we try to capture one and study it in/on our hands, it will merely melt and disappear. When we group the flakes together (interlocking their unique shapes, much like machine gears which twist and turn to work toward the end product or process), snowflakes are transformed. We can then do lots of fun things with the snow...like build a snowman, have a snowball fight, make a fort in which to hide, lie down swishing our arms and legs to create "snow angels". Hey, we can even "walk on water" in our human form with the aid of snowshoes, skis or even boots. But do you know what happens when snowflakes are really, really cold? They will not easily bind together. Yet, when temperatures are a bit warmer, the flakes will merge creating what we affectionately referred to as "snowman snow" when our children were little. I think this gives another great analogy to life in our humanity. When our heart is closed, perhaps because we have been hurt in the past or fear hurt in the future, we lose sight of the NOW. We then can be perceived as being "cold". We have a hard time melding with others. When our heart is open, we are perceived as "warm". We more easily bend and flex and merge with others, just like our snowflake friends. Opening our hearts allows us to adapt to the situations that are happening in the present moment, around and through us. 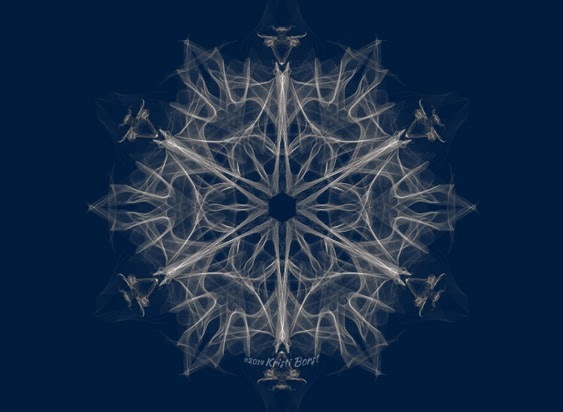 Unique snowflakes? Blanket of snow? Which is more beautiful? I love opportunities like this which enable me to see that, while we are all unique and individual, we are each part of a larger whole which is immensely more beautiful. Each day, if we are able to warm our hearts just a bit we can improve the quality of our own life and that of others. The first step in warming one's heart is truly live life in the moment. Being unencumbered by the past and the future, which at that moment only exist in the mind. To take the time and have the courage to listen for loving "that still small voice". I am remembering, that voice is NEVER wrong.